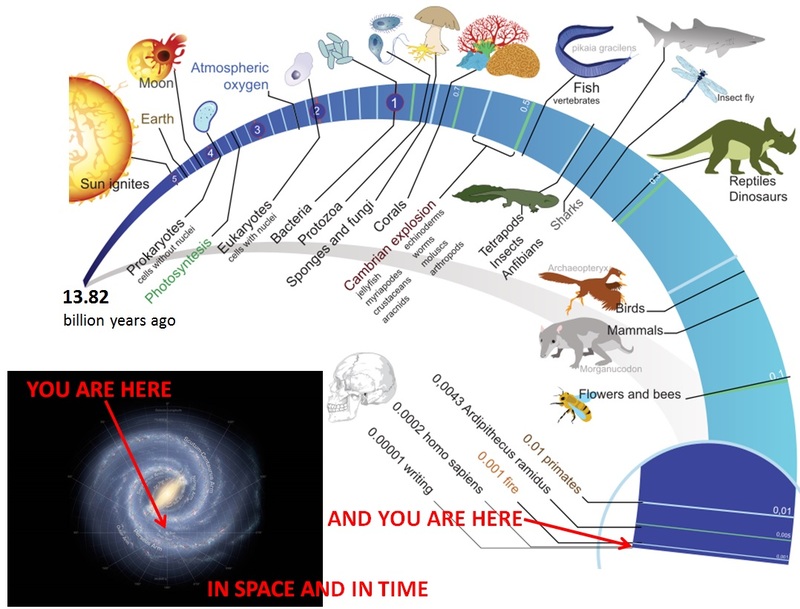 It took 13.82 billion years of evolution to get us where we are now in our particular corner of the universe . . .
. . . leaving us with an important question for our possible futures in the Anthropocene: Where do we go next? Human Learning in the Anthropocene (HLA) is a new focus area of exploration, research, reflection and development (ERR&D) of the Learning Development Institute. It comes in the wake of the Institute's prior major focus on Building the Scientific Mind (BtSM). HLA is not unrelated to BtSM, but it represents a wider and more acute focus. The rationale behind HLA is complex. A growing body of scientific research suggests that it is time for humanity to stop doing business as usual. We are becoming painfully aware that there is something terribly wrong in the relationship between humans and their planetary environment. Nobel Laureate Paul Crutzen thus named our geological epoch Anthropocene. He did so for a reason, considering that we live in an era predominantly characterized by the significant, at times disastrous, impact of human activity on the environment. A cornucopia of serious problems is the result. Our cultural development has not kept pace with the astounding increase in what we know and are technically able to do. Consequently, humanity is in for a fundamental adjustment of its way of being in the world. The problems we have to deal with in the Anthropocene are wicked and complex. They call for a different kind of human inhabitants of planet earth, i.e., culturally transformed members of our species who are able to think differently and take control of their behavior at a higher level of responsibility. Such cultural transformation calls for a different vision of what it means to learn and how we design for learning. While dealing with these issues we find ourselves still largely in terra incognita. Given this reality, HLAs attention goes in the first place to charting the terrain, to identifying and clarifying the major problems ahead and challenges to be met, and to figuring out what must be done. In this context, the HLA initiative aims at contributing to (1) a change in perceptions of human learning in ways that are relevant to the challenges of the Antropocene and (2) a change in attitudes and competencies in those involved in creating the conditions for learning in both informal and formal settings along the lifespan around the world. The focus of HLA is on both knowing and doing what must be done in the Anthropocene. Identifying, studying, developing and diffusing effective transformative processes in the development of human learning with a view to the evolving conditions of human existence in the Anthropocene. It is furthermore undertaken to underpin policy advice aiming at effecting relevant changes in the--informal and formal--learning landscape. Research in this area is cognizant of the fact that the problems with which humanity interacts in the Anthropocene are complex in nature. Such problems require of humans to be capable of complex thinking and to populate learning spaces that accommodate complex learning. Research that aims at interacting constructively with the problem environment of the Anthropocene is, by the very nature of these problems, transdisciplinary. We welcome contact with researchers and designers for learning from around the world who are interested in the above issues. Click here to access a list (permanently under construction) of relevant sources of interest: Books, papers, video and audio documents, etc. Click on the links to find out more. Most recent activity on top. July 25-29, 2018: Multi-day program segment on Learning to Think in the Anthropocene integrated with the proceedings of the 2018 Conference of the International Big History Association. October 26, 2017: Participation in the scientific round table on 'Bildung and Developmental Psychology' in Haarlem, The Netherlands. This was a follow-up round table to the ones in Stockholm and Berlin mentioned below. October 4, 2017: The Learning Development Institute (LDI) and the Institute for Interdisciplinary Research into the Anthropocene (IIRA), founded by David Cole of Western Sydney University, NSW, Australia, decided to collaborate with the aim of generating international and interdisciplinary dialogue via a series of colloquia on Learning to Think in the Anthropocene. 'Learning to think' is an important dimension (but by no means the only one!) of Building the Scientific Mind (BtSM), a program LDI has worked on for more than ten years, which we are currently bringing to a close with the publication of a book, hopefully in 2018, on 'Seeking understanding: The lifelong pursuit to build the scientific mind' as well as the production of an open access video series of conversations with authors and other key contributors. March 26, 2017: Lakeside Conversation on HLA issues. March 14, 2017: Participation in round table on 'Bildung and Developmental Psychology' in Stockholm, Sweden. This was a follow-up round table to the one in Berlin mentioned above. September 6, 2016: Participation in round table on 'Bildung and Developmental Psychology' in Berlin, Germany. July 14-17, 2016: Presentation on 'Human Learning and the Development of Mind in the Anthropocene: Reflections against the Backdrop of Big History' at the Third Biennial Conference of the International Big History Association in Amsterdam, The Netherlands. Visser, J. (2016). Human Learning and the Development of Mind in the Anthropocene: Reflections against the Backdrop of Big History. Paper presented on July 15, 2016 at the third biennial conference of the International Big History Association, Amsterdam, The Netherlands, July 14 - 17, 2016. Click here for the published version of this paper in the October 2016 issue of Origins, Vol. VI, Nr. 9. Visser, J. (2016) Slide series on Human Learning and the Development of Mind in the Anthropocene: Reflections against the Backdrop of Big History. Slides accompanying the above presentation at the third biennial conference of the International Big History Association, Amsterdam, The Netherlands, July 14 - 17, 2016.